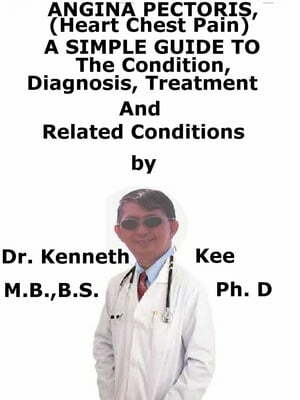 Collins Booksellers - Angina Pectoris, (Heart Chest Pain) A Simple Guide To The Condition, Diagnosis, Treatment And Related Conditions by Kenneth Kee, 9781370495849. Buy this book online. Angina pectoris is a medical symptom that literally means "strangling in the chest." Patients complain that the angina symptom is a squeezing, suffocating or burning feeling in their chest but the episode of angina is not a heart attack. The heart muscle is not injured permanently and the pain normally disappears with rest unlike a heart attack. Angina Pectoris is an early warning symptom of an ischemic heart disease (IHD). IHD is the most frequent form of heart disease in adults. It happens when a waxy substance called plaque accumulates on the inner walls of the coronary arteries. These arteries deliver oxygen-rich blood to the heart. Plaque reduces and stiffens the lumen of the coronary arteries. This decreases the flow of oxygen-rich blood to the heart muscle, inducing chest pain. Plaque buildup also tends more to induce blood clots in the arteries. Blood clots can partly or totally block blood flow, which can produce a heart attack. This is heart disease that involves the heart’s smallest coronary arteries. In coronary MVD, the plaque does not cause blockages in the arteries like it does in IHD. 1. It happens during exertion when the supply of the blood to the heart is inadequate to keep up with the higher demands of the heart muscles. 2. It can also happen when anger or fear induces the heart muscles to pump faster to deliver the body with oxygen. 3. Emotional stress can also induce spasm of the coronary arteries decreasing oxygen to the heart tissues. Stable angina is the most frequent form of angina.